The first pirate flags were red. This was intended as a warning of bloodshed. In addition, it also meant that little or no quarter (mercy) would be given to those encountered. Black flags meant death; the flag would employ skulls or skeletons to enhance the effect of the mortal threat. 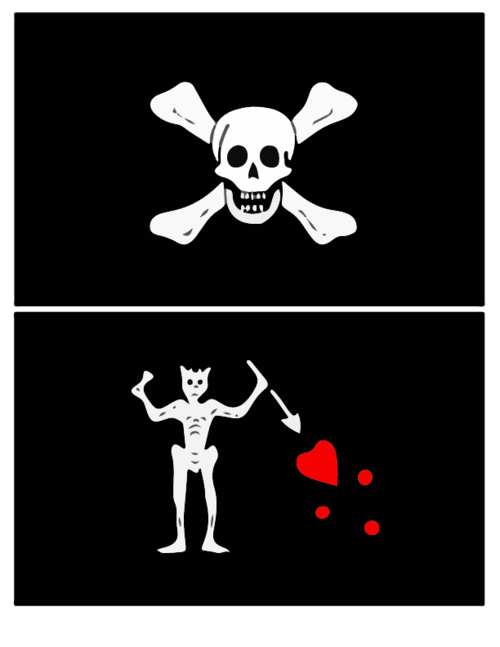 A horned skeleton with an hourglass in the right hand and a spear in the left pointed to a heart with three blots, was the flag of most know pirate, Blackbeard. Print out your own pirate flag and have a blast of time with your friends, playing pirates!